New design cheap all in one industrial computer with fan, adopts Intel Celeron J1900 quad core 2.0GHz CPU (Core i5 4200U is optional), lower power consumption and faster respone. It can support max 8 GB RAM 2.5'' SSD/HDD, 15 inch LCD sreen using highlight LCD backlight, gives you better display effect with super high definition. 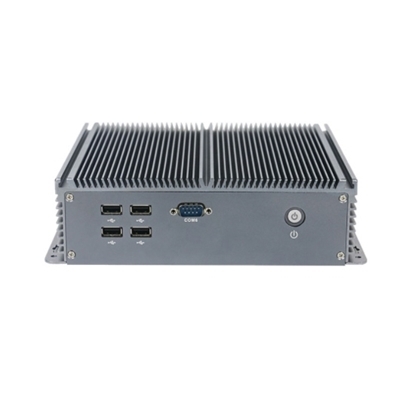 The mini fanless embedded industrial computer on sale, it adopts Intel Skylake 6th Core i3-6100U/i5-6200U dual core four threads. 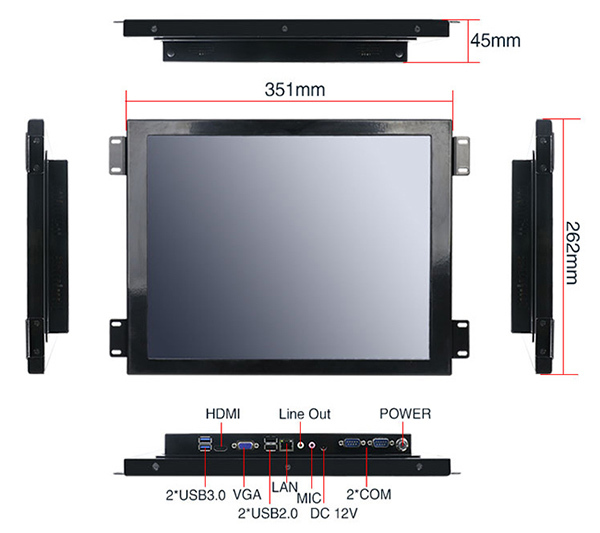 1*VGA +1*HD port +4*USB2.0 +4*USB3.0 +2*LAN +6*COM (COM2 can support RS485) rich interfaces, no noise during operation, suitable for industrial applications. The fanless design industrial PC equips with Intel Celeron 1037U dual core 1.8GHz CPU, embedded 2G DDR3 memory, 4*RS232 COM and 4*USB2.0. High quality pure aluminum body for quick heat dissipation. WiFi is optional and bracket is embedded, it can be mounted on the wall. 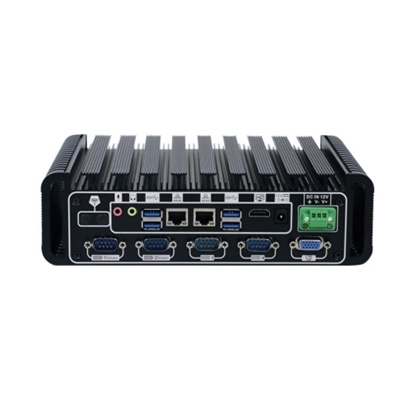 High performance fanless embedded industrial PC with 6 COM and 2 Intel Lan, adopts Intel Core 4th Haswell, QM87 chipset, core i3-4000M, core i5-4200M or i7 4702MQ for your selection. Because of its multi-interface and simple operation, it could be used for many industrial areas. 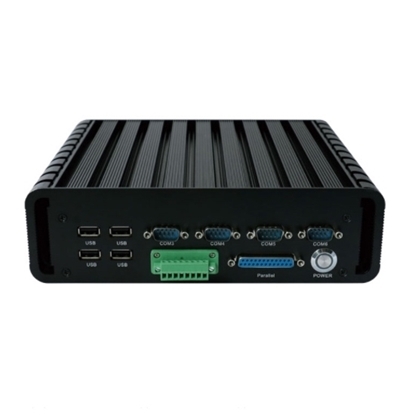 Hot sell embedded Industrial PC with fanless design, adopts Intel Celeron J1900 quad core 2.0 GHz CPU to achieve stable performance, lower power consumption and faster response. It supports DDR3 max 8GB Ram slot, windows 7/8/10, linux OS. 6 COM, 2 LAN, 8 USB rich interfaces to meet a variety of external devices. *Packing list included PC + Power Adapter + Power Cord + CD Driver. *RAM, SSD, HDD, WiFi, Bluetooth are optional, if necessary, please contact customer service for your configuration. *Need more fanless industrial PCs models information, please check the Model Brochure. The solid internal hard disk (SSD) has a simple internal structure and adopts a PCB board to carry a main control chip and a flash memory chip, which constitutes an important internal main body. In addition, the internal capacity is extended by the combination of solid state electronic disk array, and the working efficiency and anti-seismic ability of the hard disk are greatly improved by reducing the complexity of the parts compared with the mechanical hard disk. In terms of reading and writing performance, the theoretical bandwidth and reading and writing speed will be 5~10 times faster than that of the mechanical hard disk, using the solid state hard disk carrying NAND flash memory particles and the high speed serial interface. Industrial computer with industrial solid state hard disk will be more advantageous than mechanical hard disk in bad working environment, such as reading and writing speed, earthquake resistance, easy fall, long time operation and so on.